Nobuyoshi Asai in Falling Out. Photo by Phantom Limb Company. BOTTOM LINE: Created after 2011's tragic events in Fukushima, Japan, Falling Out is a visually stunning exploration of humanity's relationship with disaster. First you see mounds of trash bags and an image of desolation—a reminder that places we call home can turn into shambles in one blink of an eye when the earth turns against her insignificant inhabitants. Falling Out is a performance about humanity’s relationship with natural disaster, the duality where strength is in constant battle with fragility. Falling Out is the culmination of years of research after the 2011 earthquake, tsunami, and nuclear meltdown in the regions of Fukushima, Japan. In one village, 40 people died, including all the leaders who would’ve been looked upon both to make decisions and to start picking up the broken pieces in the aftermath of such a tragedy. The performance is also inspired by the data and stories collected by international volunteer organization SafeCast, on the front line after the catastrophe. And now, this is a performance about survivors. With Falling Out, Phantom Limb Company has created a gorgeously enigmatic show that’s the final installment of a trilogy, cryptic in the most satisfying way. 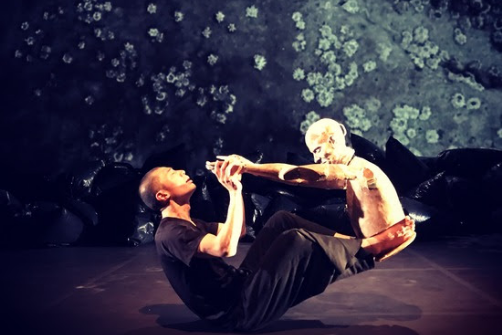 Combining modern dance with traditional Japanese Butoh-style movements, bodies become waves and the performers, thanks to their facility with silent language, are captivating even in stillness. The choreography might be one of the most interesting aspects, one that is intricately connected to the video projections as well. Footage of survivors describing the aftermath is projected onto the backdrop as dancers start to translate the instinctual gestures into stylized movements. And thus, the choreography is made up of echoes of a tragedy so great that it will be imprinted in our collective DNA. Then there’s the soundscape. Erik Sanko’s somewhat ominous composition is constantly disrupted by none other than a cellphone ring that will never be answered again. In a simulated post-apocalyptic wilderness, the electronic tone from a cellphone becomes the scariest, but also warmest, most hopeful sound there can be. Puppetry adds another visceral layer—literal limbs fall out of a sea of trash bags, and I was both deeply moved and disturbed at the same time. The show’s life-size puppets represent both people whose lives were taken during the disaster, as well as their spirits in a metaphorical afterlife, sustained by the survivors’ memories. Those puppets are found in broken pieces, and are handled with uttermost care and tenderness by the ensemble. In one gut-wrenching moment, you watch the reunion of two people as they are stitched back together, from pieces into a whole. And you think, there’s hope yet. There are a lot of moments of chaos, perhaps expected in a piece about such a tremendous disaster. But the company puts equal emphasis on silence and stillness. And this is what the show made me think about: it is death that scares us the most. Not in its violence, not in its thundering roars—you forget about fear in violence—but in the quietude that follows. It’s a cruel, perfect stillness that you cannot cut through. This is not a show that wishes to bring you joy; it doesn’t even pretend to. Nor does it promise clarity, for when faced with an enraged ocean, all we can do is admit our helplessness. At the end of the performance, the ensemble recreates a three-dimensional, surreal representation of the ocean using stage-length stretches of mesh fabric and Brian H. Scott's ingeniously designed lighting effects. A lone silhouette stands on the shore as waves (made with those omnipotent black trash bags) crash against the rocks and cover the ravaged bodies of his fallen kin. It’s the most beautiful, most cruel image I’ve seen on stage. And with that alone, I believe I received the message Phantom Limb wished to convey. Falling Out has a lot of strong points: provocative, visceral imagery, and the inventive ways it connects the natural world to abstract expressions. It’s also a performance that might not be so easily accessible. Between the language barrier and the highly symbolic ways of storytelling, there were times I felt Falling Out washing over me. However, certain moments stirred some of the most primal emotions within me. What is more, Falling Out presents an urge to connect, to mourn the loss of many, and to regain the courage to start over. And I believe that’s enough. Falling Out is by Phantom Limb Company. Direction and Design by Jessica Grindstaff. Original music and Puppet Design by Erik Sanko. Butoh Master is Dai Matsuoka. Costume Design by Henrik Vibskov. Lighting Design by Brian H. Scott. Sound Design by Darron L West. Video Design by Keith Skretch. Dramaturgy by Janice Paran. Creative Producer is Mara Isaacs/Octopus Theatricals. Production Manager is Meg Kelly. Stage Manager is Randi Rivera. The cast is Banks Artiste, Nobuyoshi Asai, Kevin Boateng, Emeri Fetzer, Takemi Kitamura, and Carlton Cyrus Ward.